The Elbphilharmonie sits above the harbor in Hamburg. Photo courtesy of Wikimedia Commons. The signature structure of 21st century Germany sits atop an old pier above a dramatic bend in the Elbe River. Its creative design features performance space for the philharmonic, a dramatically curved escalator, and a dozen different public spaces for people to gather and enjoy spectacular city views. But what California needs more than this stunning new piece of architecture is the scandal that built it. Originally planned in 2007 as a 186 million Euro project, financed with 77 million Euros from taxpayers, the Elbphilharmonie was so dogged by delays and overspending that its final price tag approached 1 billion Euros, with taxpayers paying 789 million. The good news: The concert hall, as a fiscal embarrassment, inspired a furious public reaction that in turn produced one of the world’s most advanced government transparency laws. And that law, unlike the hall, can be transported to California, where our transparency rules mostly produce frustration. In California, the onus—and much of the expense—of getting access to government papers and people is put on citizens, who have little leverage to force governments to comply. Our open records laws often force citizens to identify records and bear the burden and expense of requesting documents, fighting for access, and obtaining copies. And because of deep mistrust between California’s people and our governments, our open meetings laws involve putting restrictions on the power and discretion of our government representatives—we dictate when they can meet, when they can talk to each other, when they can email one another. As a result, California’s law, by limiting the power both of citizens and their government officials, actually empower wealthy players outside government, especially developers and unions, because they are not limited by the same restrictions as government officials. Hamburg’s transparency law works differently because it empowers everybody, both citizens and government officials. The law sets a default of openness by requiring government officials to make their documents—contracts, memos, deliberations—viewable on the internet, almost as soon as they produce them. Citizens in Hamburg—or anyone really, anywhere in the world— can access records simply by going online and searching through an online portal. I learned about Hamburg transparency on a recent visit to the port city, where I was the guest of local journalist Angelika Gardiner and farmer Manfred Brandt, who let me sleep in his barn. I’d gotten to know the two of them in recent years while serving as co-president of the Global Forum on Modern Direct Democracy, a network of journalists, scholars, activists, and election around the world. 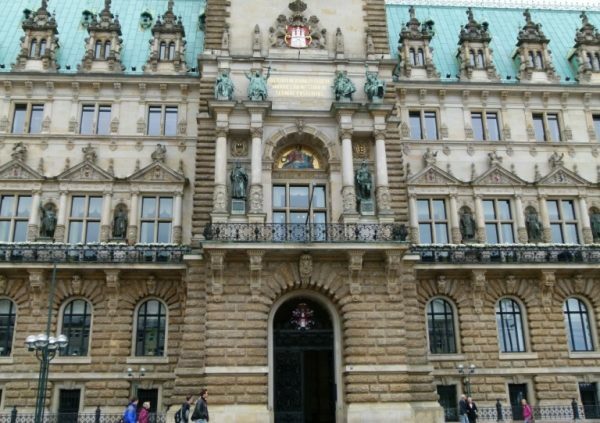 For those who work in the Rathaus, the seat of Hamburg’s state government, transparency is automatic and immediate. Photo courtesy of Wikimedia Commons. Twenty years ago, Gardiner, Brandt, and other citizens began using direct democracy to reshape the constitution of Hamburg, which is both a city and one of Germany’s 16 states, giving it a special double status. They wanted to bring transparency to Hamburg government, which used opaque public-private contracts for many building projects. Germany’s federal freedom of information law, which like California laws put the onus on citizens to identify and seek records, wasn’t very effective. 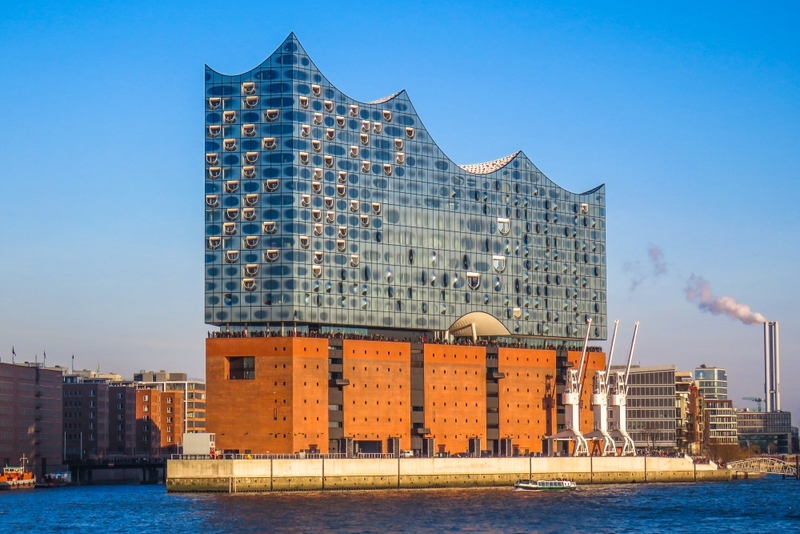 Elbphilharmonie’s cost problems offered an opening. In 2011, using photos of the construction site with the slogan “Transparency Creates Trust,” several groups—from Transparency International to the Chaos Computer Club to Brandt and Gardiner’s More Democracy—drafted a ballot initiative to establish a transparency law. Their idea was to create an information register online where the government would have to publish all its documents; citizens could then search it anonymously, free of charge. Modeling the sort of government they sought, they used a public Wiki to develop their ballot initiative for transparency. A retired supreme court judge helped complete a legally sound draft on an unpaid voluntary basis. Such an open drafting process is uncommon in California’s more corporate initiative process, which is dominated by wealthy individuals, massive interest groups, and professional political firms. The initiative was a sensation. After the groups gathered 15,000 signatures to put their measure on the ballot, the Hamburg parliament, bowing to the inevitable, adopted their proposal before a public vote could be held. The law went into effect five years ago this month, in October 2012. It took until 2014 to get everything online, but the Transparenzportal is now a treasure trove—contracts, reports, plans, grant awards, proposed resolutions, spatial data, permits, even payments and benefits for senior officials are available for your perusal. The law guarantees “immediate” access, which usually means documents must be published within a week of their creation. About 60 percent of the documents involve permits and decisions around buildings of some sort. In the last two years, the portal has been accessed nearly 23 million times. The transparency has not been total. Smaller contracts (those less than 100,000 Euros) aren’t always published online. An expansive exemption for personal privacy requires redaction of some information that would seem relevant—at least to this cynical Californian—for holding local officials accountable. And some companies that do business with Hamburg have fought disclosure, arguing that the aggressive transparency forces them unnecessarily to disclose trade secrets. But an evaluation of the law, required after five years, concluded that things are working as intended. Among the most intriguing findings: Hamburg’s government officials, who once worried about transparency’s costs, are now some of its biggest fans. Indeed, while citizens do use the law (and large majorities in surveys say the transparency has enhanced political participation), some of the most aggressive users of the transparency are Hamburg officials trying to figure out what people in other departments are doing. In this way, the transparency law may be most effective as a force for efficiency within the government, breaking down bureaucratic silos. The links hand now knows what the recht hand is doing. That’s the lesson of Hamburg: With ordinary people so consumed with their own work and lives, the best check on government abuses and corruption are city officials themselves. The law sets a default of openness by requiring government officials to make their documents—contracts, memos, deliberations—viewable on the internet, almost as soon as they produce them. Dressel may have been exaggerating, but the merits of a switch to Hamburg-style transparency are apparent. A law that makes disclosure an automatic online default should be more effective than California’s records and meetings laws, which are all but designed to create conflict between public demands for access and government desire for secrecy. Such transparency would jumpstart the nascent open data movement, which has seen the state and some cities put up data sets so that tech-savvy citizens can help solve government problems. And it’s not hard to see how a transparency law might make government responses to crises faster and more effective. In San Diego, officials in different city and county departments failed to communicate effectively for months earlier this year as a deadly hepatitis epidemic spread, according to the nonprofit Voice of San Diego. If officials could have seen their separate work and information online, it’s quite possible that a fuller response—which included a declaration of emergency—might have come earlier and saved lives. So far 17 people have died. Of course, such transparency would be opposed by government contractors, public employee unions, and the local governments over which they exert too much control. But it is for situations like this that we have direct democracy in California. And in Hamburg.